So, the Super Bowl is coming up this weekend. Have you ever been to a Super Bowl party where the majority of the food wasn’t high-carb, high-fat, and/or low-protein? Okay, there might be some wings, if you’re lucky, but most of the time it’s chips, dip, beer, wine, pizza, burgers, etc. Not exactly a good way to stay on your diabetic food plan or your diet. You need something like Sweet Potato Bean Dip on the table. This dip is made with sweet potatoes, white beans, and Parmesan cheese. I know it sounds unusual, but it’s really good. You can serve it with raw veggies such as celery and carrots or whole-grain crackers (watch your carb grams). If you don’t have Cannellini beans on hand, any white beans will do. I got the idea for this recipe from Food Network Magazine. The “day after” in the title refers to Thanksgiving. This was a suggestion about what to do with leftover sweet potatoes. 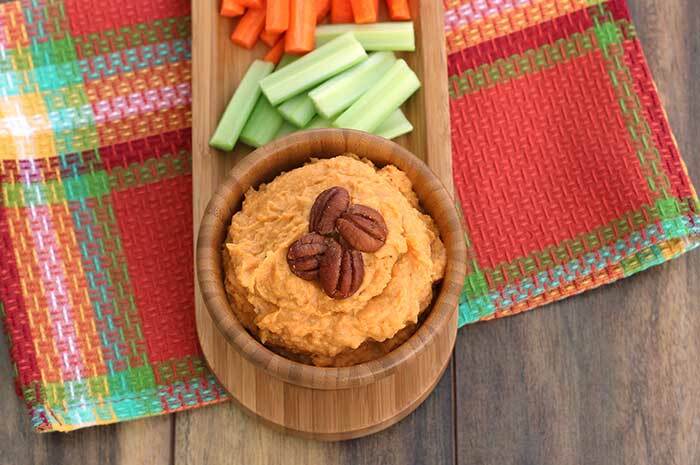 This sweet potato bean dip is low in cholesterol and is a good source of manganese and Vitamin A. Tip: Parmesan cheese keeps better (and tastes better!) if you buy a block and only shred what you need as you go. Like dips featuring beans? You might also like Smoky Black Bean Dip. This dip is made with sweet potatoes, white beans, and Parmesan cheese. I know it sounds unusual, but it's really good. You can serve it with raw veggies such as celery and carrots or whole-grain crackers (watch your carb grams). Toast the pecans in a dry pan over medium heat. Set aside. Cut sweet potatoes in half lengthwise and scoop flesh into a food processor along with the beans, olive oil and cheese. Purée until smooth. Add salt and pepper to taste. Place in serving dish and garnish with pecans. Estimated nutritional information does not include crackers, celery, etc.